Jet fire seal clips should be insulated. Tested to J60 in accordance with HSE standard OTI 95 634 Lloyds Register of Shipping, Certificate No. SAS F050036, valid to Feb 2010, Blast over-pressure to 1.35 bar g, Lloyds Register of Shipping Certificate No. LWT 401087/1. Each seal is supplied with fitting instructions, adhesive and stainless steel worm drive clips to suit pipe and sleeve diameters. 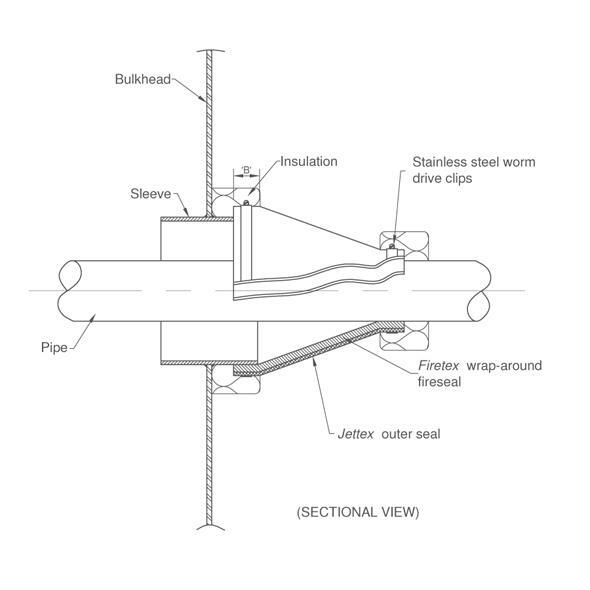 For diameters of 350mm and above ‘double clipping’ is required. The clipping length or cuff (B) is 50mm for single clips and 70mm for double clips.